A global collaboration including five University of Notre Dame researchers has revised the half-life of samarium-146 (146Sm), reducing it to 68 million years from 103 million years. The finding is published in the journal Science. The revised half-life, which is 34 percent shorter than the previously adopted value, affects the understanding of processes leading to the formation of the solar system, and the dating of some major geological events in the mantles of Earth and other terrestrial planets in the early solar system. Samarium-146 is one of the main tools for establishing the evolution of the solar system over its first few hundred million years. It is a radioactive atom that is used as a clock for dating the separation of mantles of the terrestrial planets — e.g., Earth, the moon, Mars and meteorite parent bodies — to regions with different chemical compositions, including the formation of crust from the mantle, in the early solar system. Samarium-146, which is produced only in stars, does not occur naturally on Earth. It decays to neodymium-142 (142Nd), so the presence of excess 142Nd in the geological record indicates the previous presence of 146Sm. The researchers produced 146Sm samples in a reactor and used Accelerator Mass Spectrometry (AMS) to separate the isotope from other material with mass 146 (called isobars). Measurements were taken using the high-energy ATLAS accelerator facility at Argonne National Laboratory utilizing the gas-filled magnet technique. This technique was developed by a collaboration between Argonne physicists; Philippe Collon, professor of physics at the University of Notre Dame; and Michael Paul from the Hebrew University in Jerusalem. “Samarium-146 has a whole number of different applications that are specific to geological dating of these events. It goes back to the formation of the Solar System and the formation of Earth. That clearly changes some of the models and is an important piece of information. 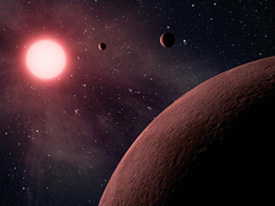 It is going to have implications on some of the models we have and our understanding of the formation of the Solar System and any extraterrestrial planetary system we are looking at,” Collon said. Collon along with Xiaodong Tang, a professor of physics; Yoav Kashiv, a visiting scholar who cowrote the paper; and graduate students Dan Robertson and Chris Schmitt were part of the research collaboration that involved groups from Israel, Japan and Argonne National Laboratory. Background information on this research is available on the College of Science website. Originally published by Marissa Gebhard at newsinfo.nd.edu on March 30, 2012.